The Dog Park at Bideawee is a member’s only park with an annual fee ($40, up to 2 dogs). There are large dog and small dog areas. The total area is just under an acre and it is completely fenced and double gated. There is shade, water, trash bins and seating areas. Hours are from 9am – 1pm, 3pm – 5pm (Tues & Thurs until 8pm) daily. The park is not handicap accessible. For info on memberships, go to Dog Park at Bideawee. This 1.8-acre dog park is located within 627-acre Blydenburgh County Park. The dog park includes both an open field and woods, a small dog area and a large dog area, water fountains for each area, completely fenced with doubled-gated entries, and plenty of benches and waste bag dispensers and garbage cans. Ground cover is a mixture of wood chips and dirt. This is a beautiful facility for dog lovers, with lots of shade provided in both the large and small dog areas. Many thanks to Suffolk County Legislator John Kennedy, the Suffolk County Parks Department, and all the members of LI-DOG who worked to get this park built. Hours: dawn to dusk daily. Entrance fee (for entire park) on weekends and holidays from Memorial Day to Labor Day. Free all other times. For more information, check out the Blydenburgh Dog Park Facebook Group. This 1.5-acre dog park is enclosed with a 4-ft high chain link fence with two double-gated entries. The ground is covered by wood chips to keep down the dust and mud. The large and small dog areas each have running water. Trash collection will be provided, but dog owners are asked to bring their own bags. The Parks Dept. has built two large PVC towers to hold donated bags. Parking is available for more than 30 cars. The dog park is located just south of the Baymen Soccer Club Fields. Please note: Dogs are not allowed either leashed or unleashed on the Soccer Club fields at any time. 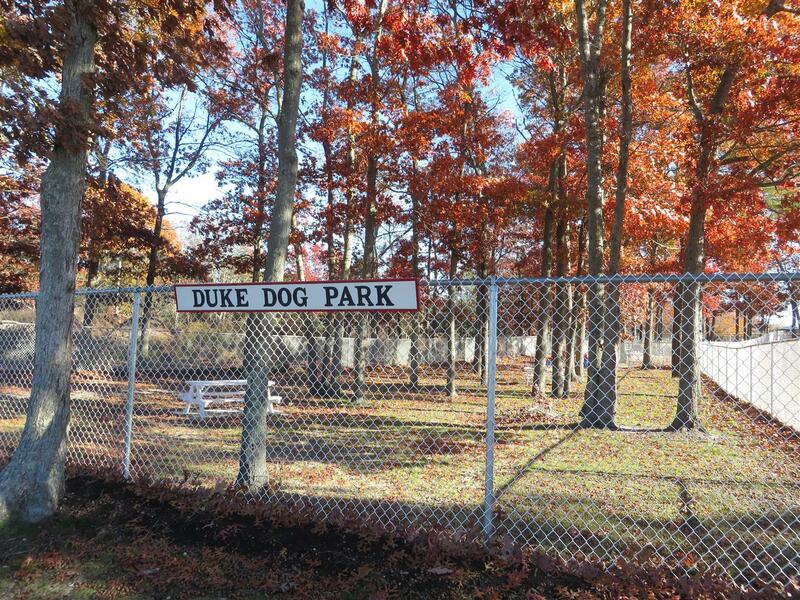 This dog park was the third dog park created under Suffolk County’s Five New Dog Parks initiative, which LI-DOG got passed into law in 2007. To learn more about the park, go to the Cherry Avenue Dog Park Facebook Group. This approximately 1 acre dog park within Riverhead’s Stotzky Memorial Park is located off Pulaski St. behind the skate park and ball field. It’s divided into small dog and large dog areas of about equal size, is fully fenced and has double-gated entries. The site is dotted with lots of trees that provide ample shade during the summer. Ground cover is mostly grass with some dirt. There are waste bag dispensers, garbage cans, and benches and picnic tables within the dog park. Water is available, but the fountain is located by the ball field next to the dog park. 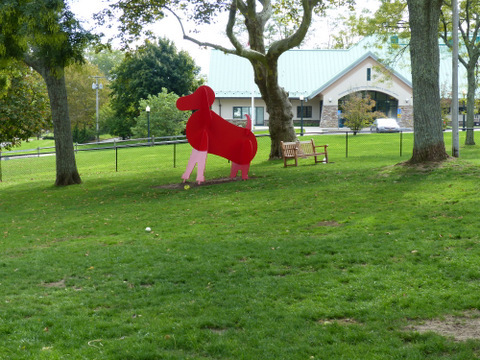 Ideal for those who live in the East Northport area, the Huntington Town dog run covers about two-thirds of an acre. It has waste bag stations, a shade/rain pavilion with benches, and running water at the far end. There are two double-gated entries into the run and the ground is mostly grass and dirt. There are no separate areas for large dogs and small dogs. One of the best features of the dog park is that you can see dogs from the Huntington Animal Shelter playing in the Shelter run not too far away and maybe find a new best friend for your dog! Note: You must be a Huntington Township resident to use this park. Permits are free and available at the nearby Huntington Dog Shelter. To get a permit your dog must be licensed and current on their rabies vaccination, and you must be a Huntington resident. See Town of Huntington for the dog park rules. Follow the road past the dog park and go into the second building, which is the Huntington Dog Shelter office where you can get the permit. 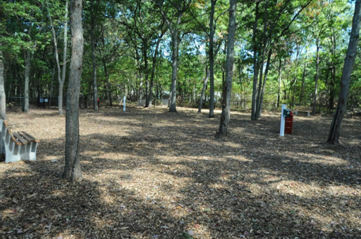 This approximately 1 acre dog park is located within Riverhead’s 62-acre Veteran’s Memorial Park. The dog park is divided into large dog and small dog areas of about equal size, it is fully fenced and has double-gated entries. Once again, the Town has left a number of good-sized trees in both areas of the dog park, so there is ample shade during the summer. Ground cover is mostly grass with some dirt. There are benches and picnic tables (with paw prints on them), waste bag dispensers and trash cans. There is no water within the dog park. An added benefit: Trails and walkways within Veterans Park can be walked with on-leash dogs. The Middle Island Dog Park is located at 1075 Middle Country Road in Middle Island. When you pass the lake, look for the old Kmart shopping center on the North side of Middle Country Road (aka Route 25). Pull into the parking lot and go to the right of the old Kmart store. You will see the park hidden in lush trees on the right side. The park consists of a total of four acres, with separate areas for large dogs (over 30 pounds) and small dogs (under 30 pounds), double-gated entries; a water fountain for each area; plenty of benches; and waste bag dispensers. Your dogs can slide in the sand, roll in the shade, get wet and make more friends than they’ve ever dreamed possible. 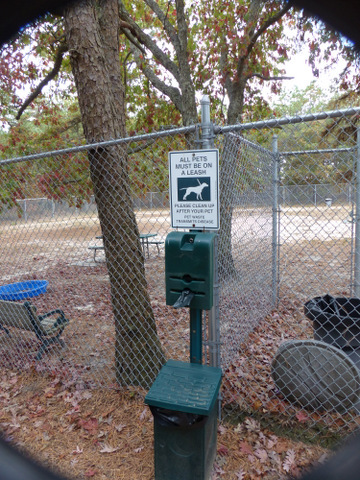 Middle Island was the first dog park in the Town of Brookhaven, and YOU MUST GET A POOCH PASS TO GET INTO THE PARK–all dogs must have their rabies shots and be spayed or neutered to attend the park. May temporarily close March 1st through June 30th to protect potential nesting birds. 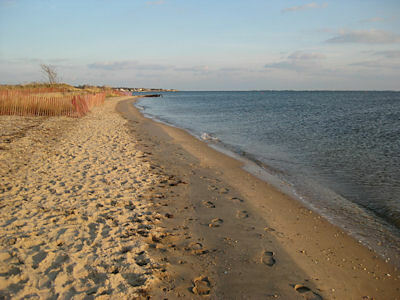 This sandy beach where dogs are officially allowed to run, play and swim off-leash faces onto the Great South Bay. The beach is several hundred feet long and has a low dune along the back. There are no amenities such as water, benches or garbage cans. The site is designated “carry-in, carry-out,” which means people have to take out waste created by their dogs and dispose of it properly away from the site. There is a PVC pole near the entrance that people fill with bags if you forget to bring your own waste bags. 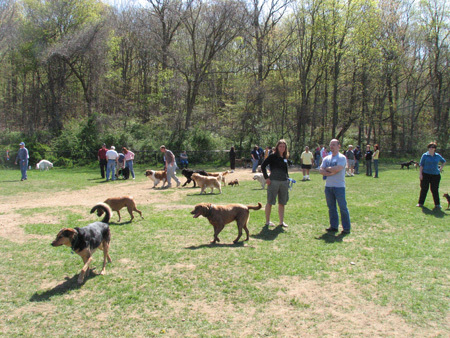 This was the first natural borders dog park created by Suffolk County in 2009 as a result of legislation LI-DOG got passed into law. As a natural borders dog park, the beach has no formal fences so it’s important your dog will reliably come when called. Caution: this site was previously used for glass recycling and dredge material disposal; considerable broken glass has been found in the sand. Also, there is abundant poison ivy. Exercise caution when using this site. Keep dogs on the beach and avoid allowing them to run behind the dunes. Get the latest on conditions at the beach, by checking out the Mud Creek Facebook Group. 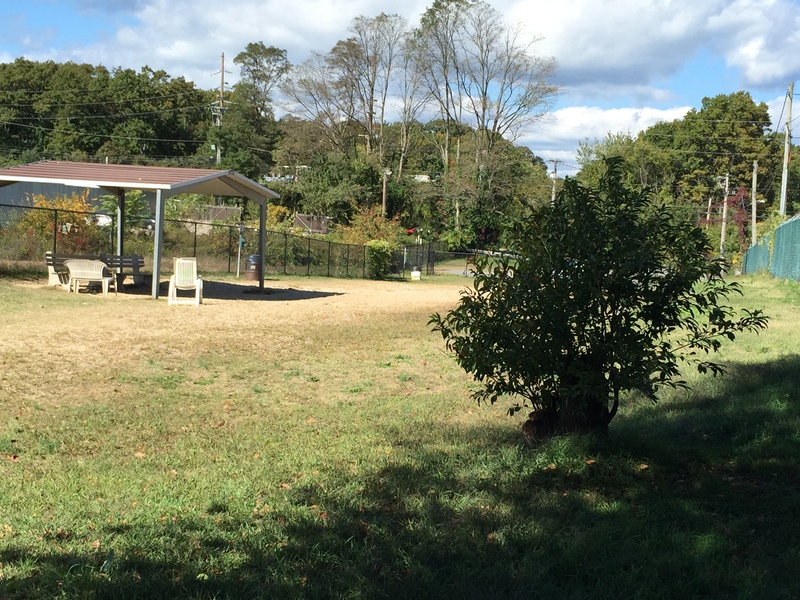 The dog park is located behind the Nesconset Library and is accessed via a half mile dirt walking trail. Note – dogs are not allowed on the adjacent paved path and must be kept on leash until in the dog park. 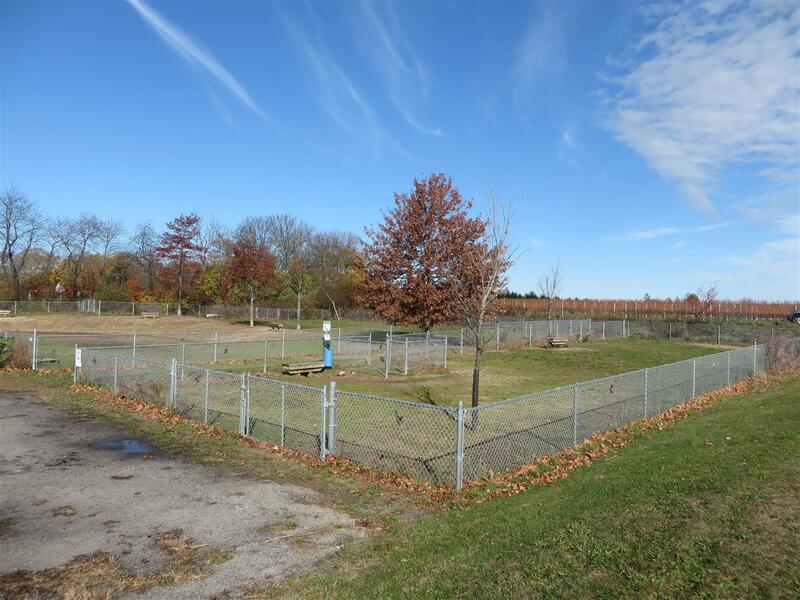 This large, 2.6-acre dog park is located on the former Robinson Duck Farm in Brookhaven Hamlet. The dog park is divided into small dog (25 lbs. and under) and large dog areas and is surrounded by wood and woven wire “livestock fencing,” designed to fit in with the natural environment. There are gated entries into each side of the dog park. There are trash receptacles, but dog owners are expected to bring their own waste disposal bags. There is no water at the site and what seating is available has been provided by park patrons. Parking is in a dirt and gravel lot located along the north side of the dog park. Because the dog park is located adjacent to Montauk Highway, dog owners are advised to keep their dogs under control and under close supervision at all times. LI-DOG thanks Suffolk County Legislator Kate Browning for working tirelessly to get this dog park created and continuing to work on its improvement! To see photos and get the latest on the dog park, go to the Robinson Duck Farm Dog Park Facebook Group. 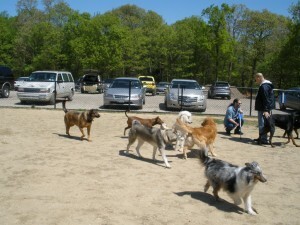 The Selden Dog Park is approximately 1.3 acres (57,000 sq. ft.). It is entirely fenced with a separate section for large dogs and one for small dogs, under 25 lbs. Each side has double-gated entries so you can unleash and leash your dog safely and easily. There are plenty of shade trees, benches, and waste bag stations. At this time, there is no running water so please bring your own. There is a gravel parking lot that accommodates 20 cars. In September 2015, an agility course was built in the large dog section by a local Boy Scout of Troop 229 as his Eagle Scout project. Thank you, Adrian! 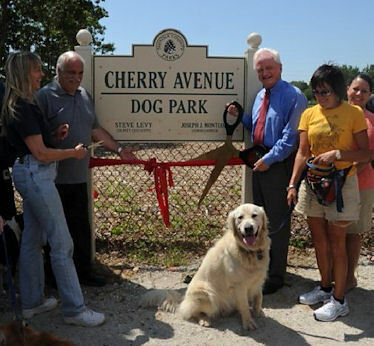 Thanks to LI-DOG, our friends at Central Suffolk Paws and its founder Irene Rabinowitz who worked with the Town of Brookhaven to create this great community park in July 2014. 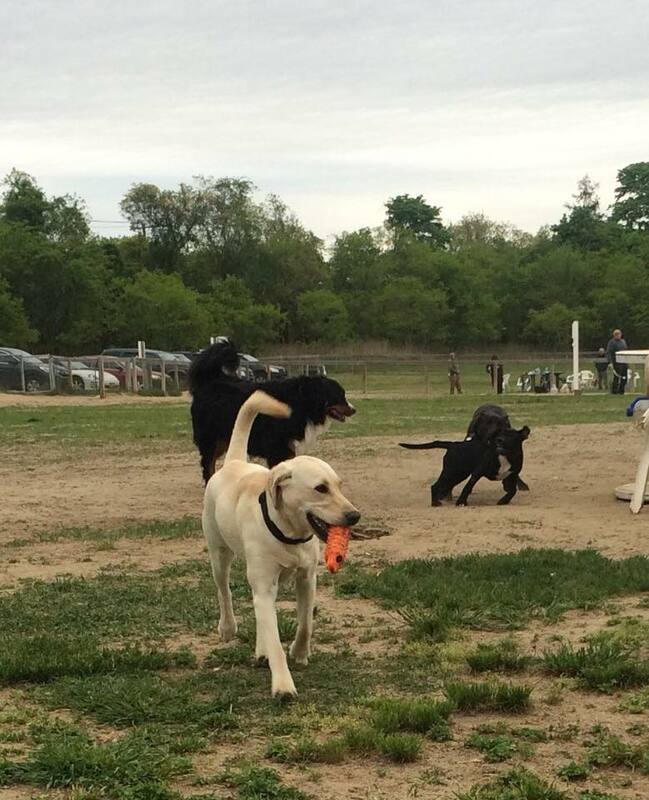 Check out what’s happening at the dog park by going to the Selden Dog Park Facebook Group. 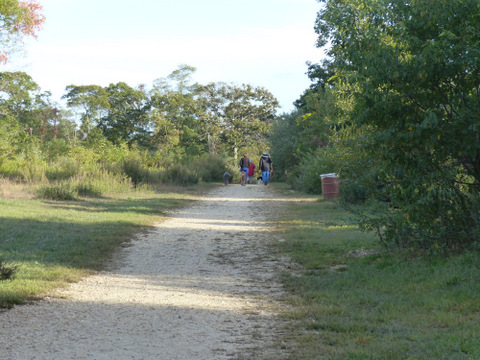 Located behind the Southold Rec Center, the Southold Dog Park was doubled in size and renovated in 2012, as a result of an organized campaign by local dog owners to improve the park. The dog park is now about 1 acre in size and is divided into large dog and small dog areas of about a ½-acre each. The dog park is fully fenced and has doubled-gated entries. Ground cover is grass and dirt and there are a handful of small trees. As of late 2015, we understand that the Town is building a new shade structure for the dog park. There are benches, waste bag dispensers and trash cans on site. Water is available on the large dog side. This is a huge ( 20 acre) off-leash park that is long (about 2500′) and narrow (about 400′). There are three paths down it’s length with many cross paths and a football sized, grassy field at the end. The park is completely fenced with 6ft livestock fencing (very small dogs might be able to squeeze through the openings). Although there is a double gated entry there are also several single gated entries. This is a one park fits all sizes -there are no separate areas for small and large dogs. There is no water and no poop bag dispensers, but there are garbage cans and a few benches. This is a wonderful park for those who enjoy walking with their dogs and it is accessible to those with disabilities. There is parking for about 20 cars, although a resident or non-resident parking permit is required – contact the Town of Easthampton, 631-324-4141 for information. Tanner Dog Park has areas for large and small dogs with water and benches, but little if any shade cover. The large dog park is narrow and curved, but gives dogs space to run. Both runs are mainly grass. Parking and bathrooms are nearby, but bathrooms are not always open. Please note: Dogs are not allowed in the rest of the park. The entrance to this large, 1.75 acre dog park is on Sweet Hollow Road just north of the intersection with Old Country Road. There are benches, a water fountain, waste bag dispensers and garbage cans. Large trees on the west side of the park provide shade in the afternoon. The dog park is surrounded by 4′ chain link fence and there are two double-gated entries. Ground cover is currently grass and dirt. There is an entrance fee for this area of West Hills Park from Memorial Day until Labor Day from 8 a.m. until 4 p.m. on the weekends. For your dog’s safety and out of consideration for the horses and their riders on the nearby trails, please keep dogs on-leash on the nearby trails. LI-DOG would like to thank Suffolk County Legislator Lou D’Amaro, the Suffolk County Parks Department, and all the members of LI-DOG who worked to get this dog park created. To get the latest on what’s happening at the dog park, go to the West Hills Dog Park Facebook Group. The small dog park at West Hills occupies the location of the original West Hills Dog Park and is located off High Hold Drive. This one-third of an acre dog park is mostly grass, surrounded by 4′ chain link fence and has two double-gated entries. There are benches, a water fountain, waste bag stations and trash cans. Parking for the dog park is across High Hold Drive in a large gravel lot. 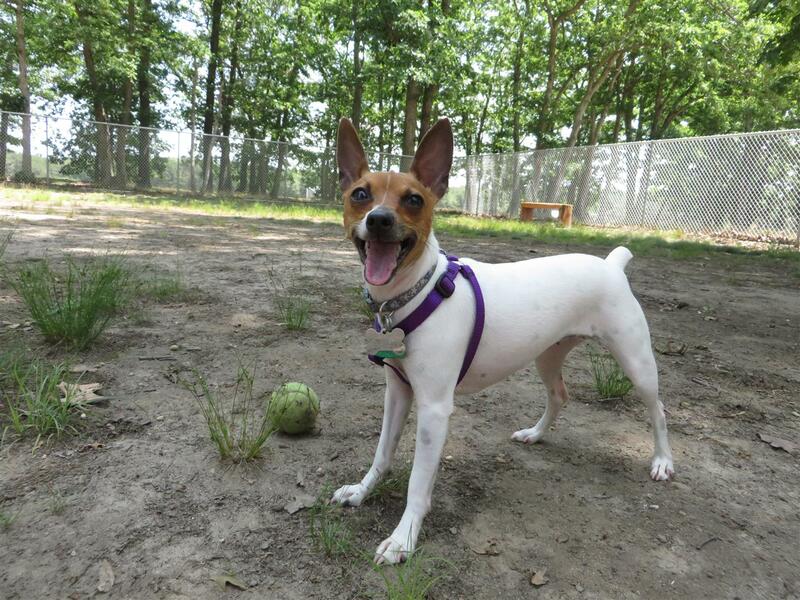 Thanks to the Suffolk County Parks Department for creating a great place for small dogs to play!